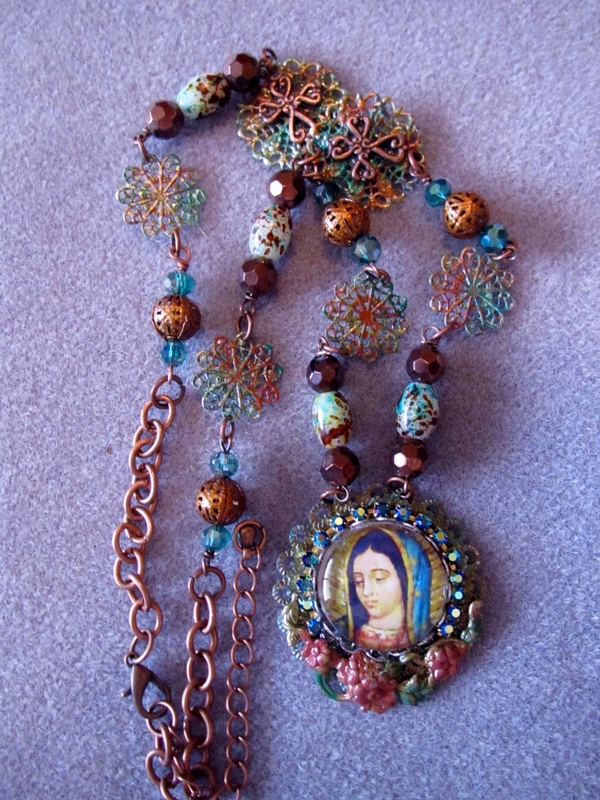 I have shared my love of hand-tinting and hand-painting metal pieces for jewelry on past blog posts. 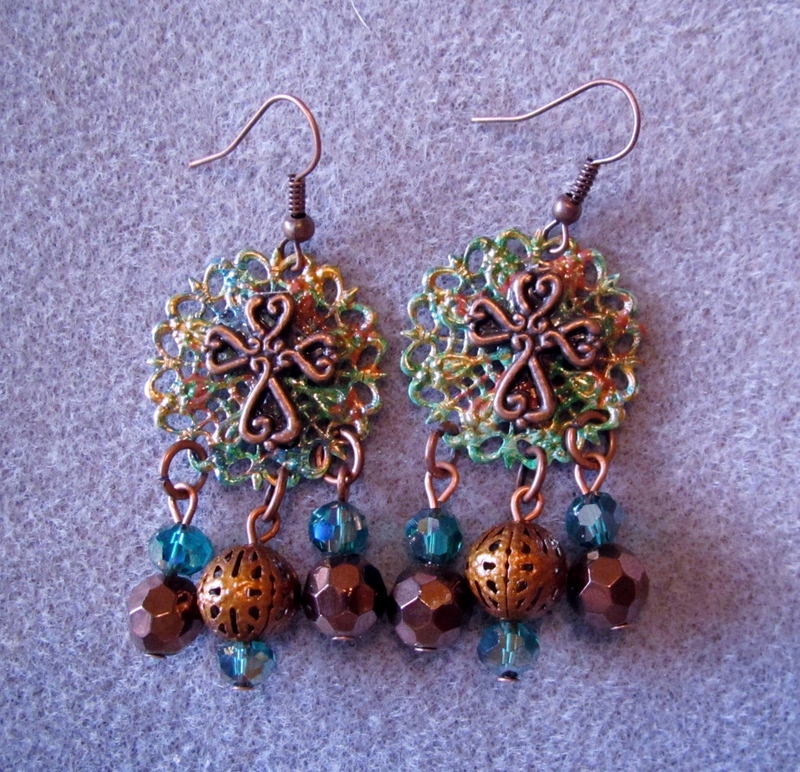 I recently had the chance to play with coloring metal jewelry components again. 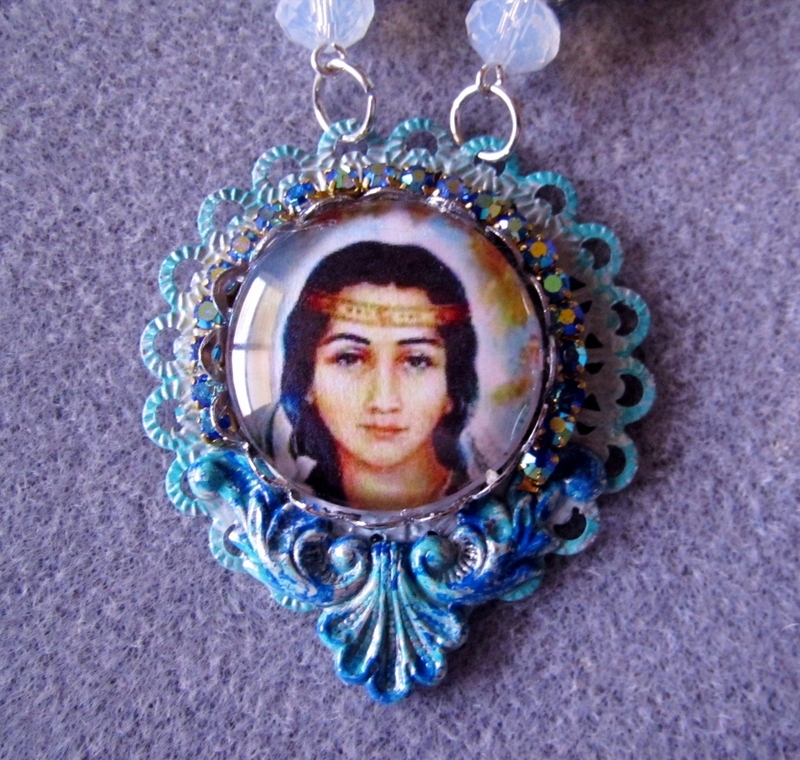 This time, I took various-sized round filigree stampings, hand-painted each one and fashioned them into necklaces and earrings. 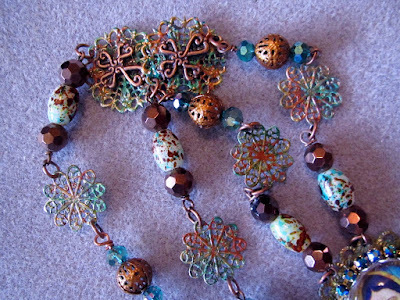 Some of the filigree pieces were further embellished with metal stampings (which I also hand-colored); mini aluminum roses or mini crosses. Saint Kateri Tekakwitha Necklace. I colored the filigree pieces with mint, white and aqua blue colored acrylic paints. After base painting the pieces, I dabbed over each with a sponge that was dipped into complementary paint colors. Once the paint dried, I sealed the filigree pieces with a polyurethane sealant. 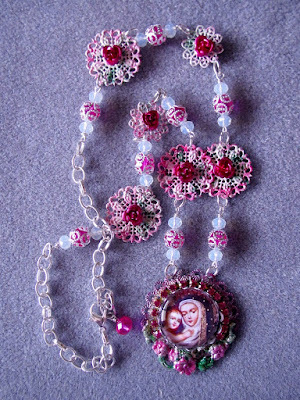 Saint Rose of Lima necklace. This one was a lot of fun to make. 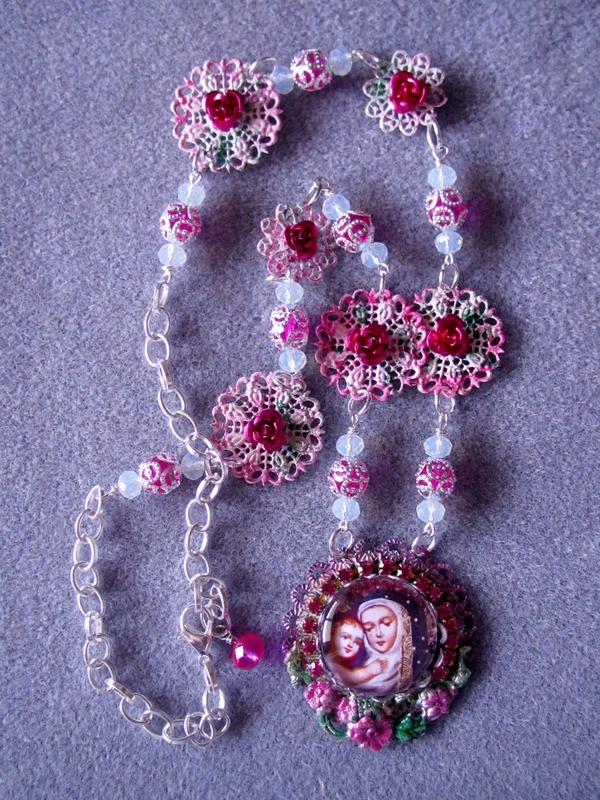 Since St. Rose is usually pictured with roses, I thought it would be nice to give her necklace a shabby chic look. To achieve this, I used a base color of white paint on the filigree pieces, then sponged over each with green and medium pink paint colors. Little pink aluminum roses adhered to the filigree pieces add extra interest to the overall design of the piece. Our Lady of Guadalupe necklace and earrings set. 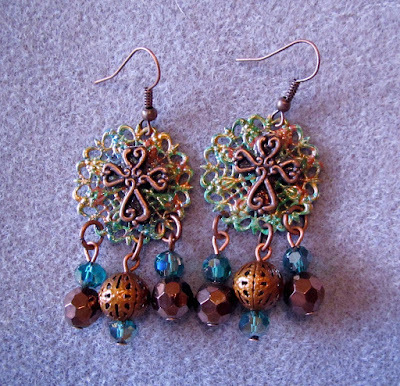 Once again, I tried to complement the colors from the image along with the colors used on the filigree pieces. I used a rich shade of metallic copper, along with bluish-green and rusty brown paints as highlight colors. Please note the roses along the bottom edge of the pendant utilize the same colors to bring everything into one cohesive design. 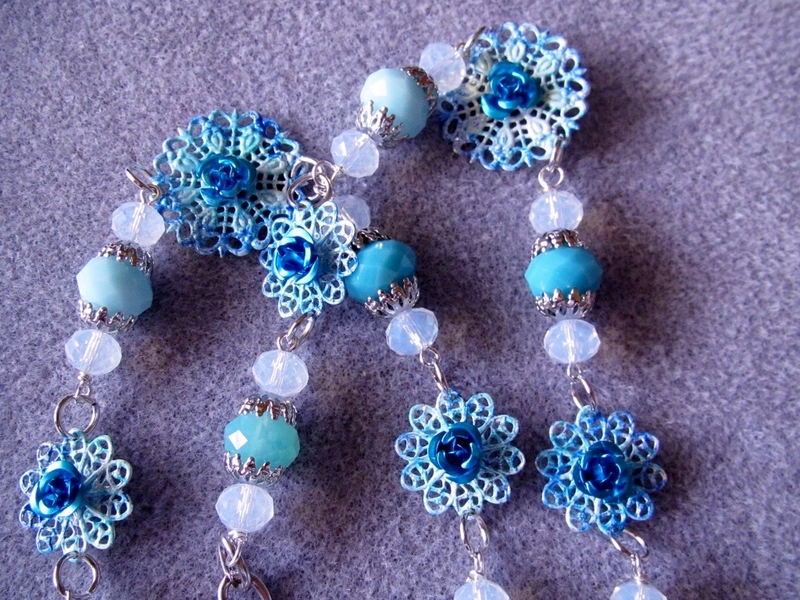 I should note that on all of the jewelry pieces shown here, I started off with plain silver-colored filigree pieces. Once the pieces are painted, no one can tell what the original color was. 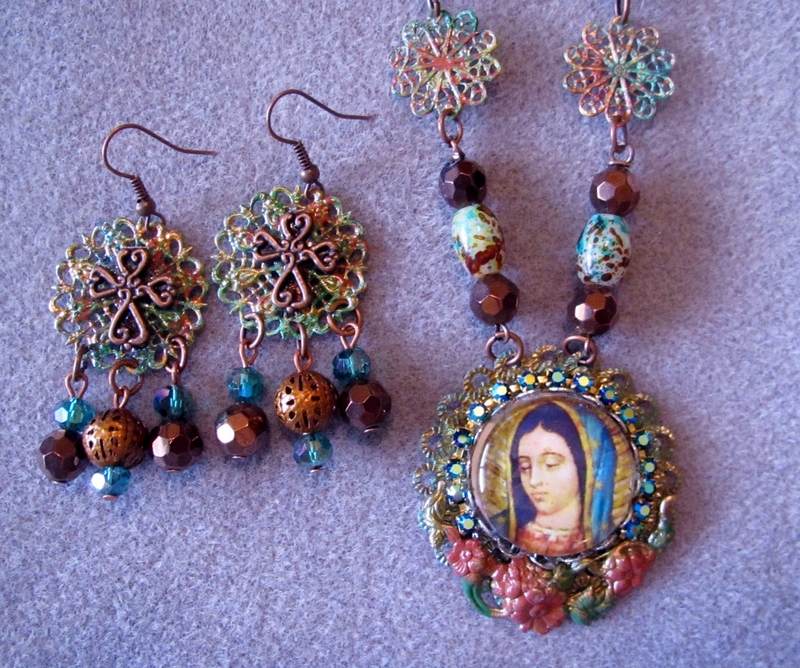 All of these pieces (and more) have been posted in my Etsy and EBay shops. These are all one of a kind pieces and will not be duplicated. Stay tuned for more new designs to be shared here later in the week. And - as always - please be sure to join me on Instagram where I often show pictures of my work in process. They say invention is the mother of necessity, and I couldn't agree more. I think as crafters, we tend to come up with unique ways of correcting project mistakes so we don't have to toss out our project only to have to start over again. I've run across some of issues when working with resin that I'd like to share with you, and also, solutions to those issues. PROBLEM: The metal bezel has an attached pendant bail that causes the pendant to rest at a slant. This results in uneven coverage of resin during the curing process. SOLUTION: After filling the bezel with resin, set the bezel on an elevated surface with the bail hanging off of the side of the surface. My favorite elevated surface for this situation are wood flooring samples. 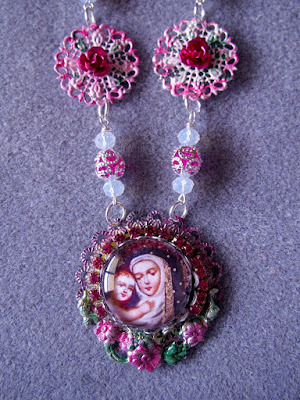 These are not very big - mine are about 6" by 8" in size - but they can accommodate lots of bezels in a small amount of space. To make good use of my space, I also perch the bezels on top of domino game pieces and place those pieces on top of the flooring samples, as well. The flooring samples can be acquired at no cost from various internet sites. I requested my samples online many years ago, and I still use them on a regular basis. Google "wood flooring samples free" to find companies who will provide you with free samples at your request. PROBLEM: Dust, dog hair, mosquitoes (and other things) end up on a project that has not fully cured. SOLUTION: I have encountered this on a couple of occasions. Unfortunately, once the hair, dust or mosquito has settled onto curing resin, the problem usually cannot be corrected with causing additional damage to the piece. I nip this problem in the bud before it ever has a chance to occur now. Once all of the resin has been poured, I place a narrow storage box over the items, and I don't remove this until the projects have cured (about 72 hours.) The one I use these days is a Sterilite storage box. It fits perfectly over two of my wood flooring pieces (as described above). Plus, because they are see-through, I can check on my work without having to disturb anything. PROBLEM: Metal bezel was too small and/or leaked, causing overflow of resin onto back of project. SOLUTION: This occurred for me recently when I made some resin pendants. I didn't discover the leak until the next day. I let the resin cure for several days before I attempted correction of the problem. Attempting to correct the problem before the resin cured would result in fingerprints and damage to the front of the design. Once the resin cured, I trimmed off the excess (cured) overflow from the sides and bottom of the bezel with old, sharp scissors. Using a coarse grit sandpaper, I sanded off the back of the metal bezel until all of the resin was gone. I was surprised at how quickly the resin was removed. Within minutes, my pendant looked like nothing had ever happened to it. PROBLEM: While gluing embellishments on a cured resin bezel, glue dripped onto the resin, destroying the shiny finish. SOLUTION: Wipe off as much of the glue as possible. Brush a thin layer of fresh resin over the top of the item and let it cure for several days. When a thin layer of resin won't correct the problem, it may be necessary to pour a thicker layer of resin over the project. I recently had something like this occur when I was gluing rhinestones to the outer edge of a pendant. 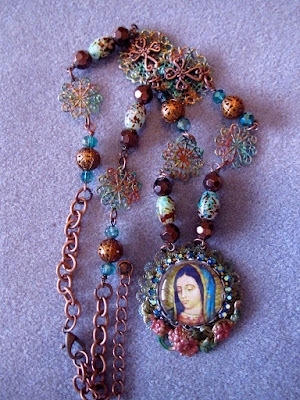 I normally use an industrial strength glue (E-6000) to attach embellishments to many of my jewelry designs. The glue had seeped out onto the resin, so I had to pour a new layer of resin over the top of the pendant. 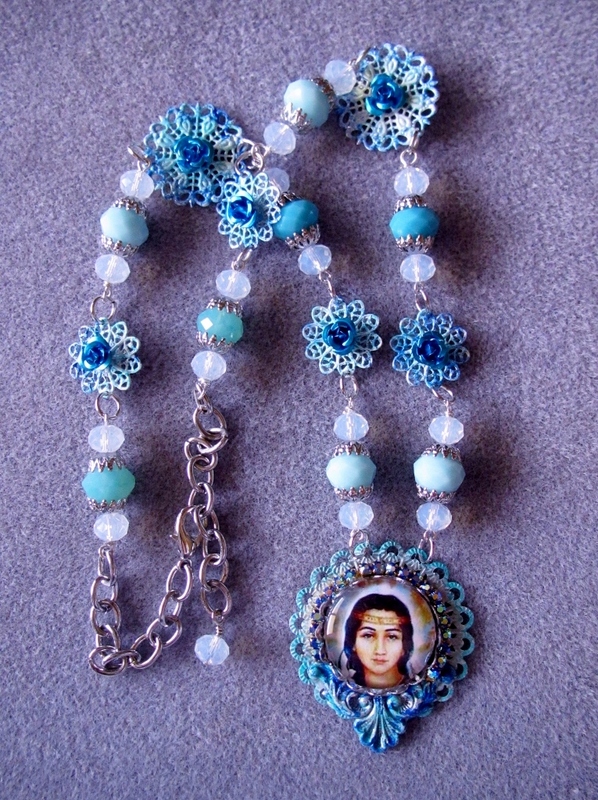 This was a problem, as well, because the pendant was already filled with resin. The rhinestones I had already attached stood at a height slightly higher then the resin; the rhinestones have gaps in between them, which would result in any newly poured resin seeping out the sides. To alleviate this from happening, I took clear packing tape and adhered it around the entire outside of the bezel. I pressed the packing tape firmly to the sides with my fingers, ensuring that the tape held onto the outer edges of the bezel. Once this is completed, you'll have something that resembles a tortilla bowl for a taco salad. The tops of the tape will be curvy and quite tall. Pour a new thin layer of resin into the bezel. Because the tape is securely attached to the outer edges of the bezel, there should be no leakage of resin. The tape will keep the resin in its place. Allow the resin to cure for several days and remove the tape. Your pendant should look as good as new. PROBLEM: Resin got on my bare hands and I can't wash it off. SOLUTION: I hate when this happens. Yes, I admit I don't always use gloves when making resin projects. I need to have the ability to "feel" what I am doing and the gloves tend to get in the way. Thankfully, there is a product on the market that is wonderful for removing resin from hands. It's called Fast Orange Hand Cleaner by Permatex. My husband - who is a crafty guy himself - uses this frequently to remove paint, etc. from his hands. I "borrowed" it one day after I couldn't remove resin residue from my hands - and it worked like a charm. Just rub it over your hands, rinse, wash hands again with soap and the residue is gone! I also use this product after working with polymer clay. It's great for getting stubborn colors - like red and pink - out of my hands. 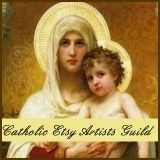 Resin Troubleshooting Tips - Preventing "Wet Out"
People often contact me for tips on the resin making process. In this resin making series, I hope to touch on some of the common problems that occur with the process and offer solutions on how to correct them. Much of what I will share with you is based on my own trial and error in making my own projects. One of the most common issues which occurs is something called "wet out." "Wet out" occurs when the resin makes contact with images. It can make your image look like it got wet, and in severe cases, it can make your whole image turn transparent. The photo to the right shows "wet out" where the angel's wings meet her dress. As you can see, it ruins the whole design. The chemicals in resin break down delicate items such as paper. In order to preserve your images, you have to protect them by coating them with sealant before you place them in resin. Coating both the back and the front of the design with white glue is usually a popular method given in books to prevent "wet out" from occurring. I was not satisfied with this method. I experimented with several different brands of white glue to seal my images and still encountered problems. The first problem was that "wet out" still occurred; the second was that I had applied the glue too thickly to the image, which resulted in it appearing as though a milky substance was floating over it. Another method that was recommended in a book I read is to cover both sides of the image with clear packing tape. Trust me when I tell you that this suggestion definitely does not work, as the resin still seeps into the tape and damages the image at hand. My favorite method to prevent "wet out" is to use glossy (not matte) gel medium. I have used both Golden's and Liquitex gel medium brands and they work equally well for this process. STEP ONE: With sharp scissors, cut out the images you will be embedding in resin. STEP TWO: Tear off a sheet of wax paper. images face down on top of the wax paper. Brush a thin coat of glossy gel medium on the back of each image. Let dry. STEP THREE: Turn over the images so they face right side up. Brush a thin coat of the gel medium on the image. Let dry. Note: The gel will look milky white when it is wet, but it will dry clear.